My 86 year old preacher dad told me a great story. Surprisingly, it was a new parable rather than one dad forgot that he told me numerous times before. Dad said a prospector worked his land digging for gold. 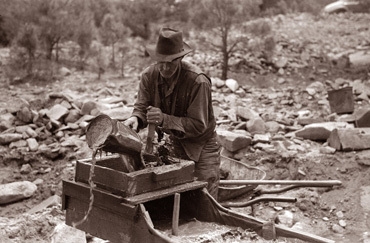 Every Saturday, the prospector would take his gold/gold dust to town and cash it in. One Saturday, he bumped into an old high school friend who had fallen upon hard financial times. The prospector graciously invited his friend to bring a shovel and dig for gold on his land. Generously, the prospector told his friend that he could keep all the gold he uncovered. Come Monday morning, the prospector's friend was a no show. The friend did not show up the entire week. Cashing in his gold on Saturday, the prospector saw and approached his friend, "What happened? I looked for you all week." The friend replied, "Do you know how much a shovel costs these days?" Dad burst into laughter at the trifling attitude of the prospector's old friend. I laughed with dad while seizing the opportunity to tell my lifelong Democrat father that the same trifling attitude is promoted by the Democrats disguised as compassion and is embraced by millions. The prospector's behavior is Republican, offering his impoverished friend (the poor), not a handout, but a golden opportunity. He offered his friend the dignity, self-respect and joy of earning his own living with endless possibilities. Remember, the old friend was told he could keep all the gold he uncovered. The old friend's behavior is that of an Obama, Democrat, Hollywood and MSM (mainstream media) indoctrinated entitlement junkie. How dare his rich prospector friend expect him to acquire a shovel. The prospector is obviously white, out-of-touch, racist, sexist and homophobic. This prospector seems like the kind of jerk who thinks it reasonable to expect all Americans to show an ID to participate in the American privilege of voting. Upon further investigation, the filthy rich SOB prospector is probably Republican, Conservative and Christian. No wonder the insensitive selfish hate-filled jerk prospector expected his old high school friend to get a shovel without government assistance and show up for work. Folks, the Democratic Party would place the prospector's old friend who lacked the initiative to acquire a shovel on a level just below sainthood, considering him to be the victim/hero in the story. This is the way Democrats view minorities and the poor; expecting very little, refusing to hold them accountable for any of their socioeconomic woes. As a matter of fact, the less initiative and self-reliance the better. Democrats simply keep the barely-enough-to-get-by handouts coming, gin up class envy and hatred for the prospector; and promise to punish him. Their sheep who are in sync with their master's voice continue to vote Democrat. If you dare suggest that people stop defrauding the government with false food stamp and disability claims http://onforb.es/1bg62j1; that blacks stop dropping out of school, shooting each other in epidemic numbers http://bit.ly/MpXCAh and stop having babies out of wedlock, the Democrats will vilify you. Their response is "Easy for you to say" you racist insensitive jerk. The Democratic Party advocates lowering the bar culturally, morally and in every area of American life. The Left/Democrats deem any suggestion of holding people to a standard as mean-spirited, racist, judgmental and dare I say, Christian. Back to the prospector – the Left would argue that because the dirt road to the town where the prospector cashed in his gold was etched by wagon-wheels, horses and the foot steps of many, the mayor should confiscate the prospector's gold and share it with everyone. Remember when Obama scolded small business owners for taking pride in building their businesses? Obama said, "You didn't build that." http://bit.ly/Jp0qM6 Obama claimed that government built roads providing infrastructure for business to operate, thus making it only fair that he redistribute wealth. Deadbeats like the prospector's old friend stood up and cheered, "Obama!..Obama!" Clearly, the prospector, the Republican, is the good guy in my dad's story. He showed real compassion for his old high school friend by offering him a "hand up" rather than a "handout." By addicting as many Americans as possible to government assistance, Democrats increase their political power. Their tried and true tactic is to brand the prospector as the devil, kick him in the teeth and encourage their ill-informed duped base to do the same. Insidiously evil. For this reason, I am a black conservative/Republican.